Is rich with tactics and will rewrite over 40 years of theory. you can determine a win for either side. Roman located 147 games and not 1 covered what you will learn on this dvd. Vol. 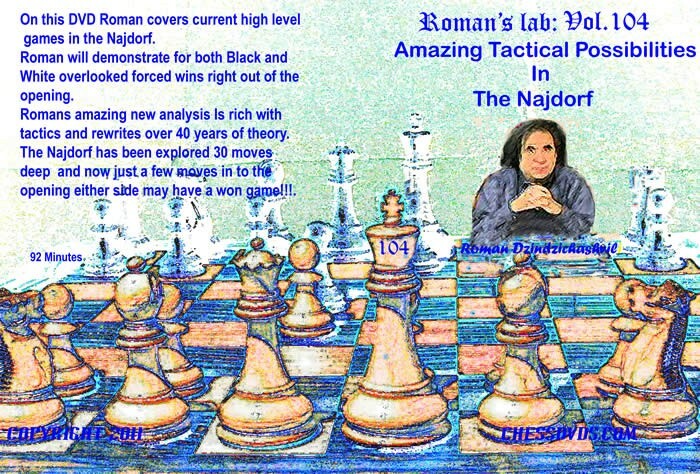 104 Amazing Tactical Possibilities in The Najdorf 92 Minutes On this DVD Roman covers current high level games in the Najdorf Roman will demonstrate for both Black and White overlooked forced wins right out of the opening. Romans amazing new analysis Is rich with tactics and will rewrite over 40 years of theory. Najdorf has been explored 30 moves deep now just a few moves in to the opening you can determine a win for either side. Nowhere will you find this original analysis Roman located 147 games and not 1 covered what you will learn on this dvd.